McCombs offers a part-time working professional MBA Program option in Houston and Dallas, called the Weekend MBA. The UT Austin part-time MBA offering allows students to pursue an MBA while continuing with their careers. The 48-credit curriculum can be completed over two years, spanning five different semesters. Classes are held on alternating weekends from 4-8 p.m. Fridays, and Saturdays from 8 a.m. to 5 p.m. The Dallas Weekend MBA program covers integral business values and skills like teamwork and leadership skills, business ethics, effective communication and problem solving abilities. This is a lock-step, cohort-based program that allows students to build a strong business network, and work closely with the majority of their peers in the program. At the beginning of the first semester, students are put into study groups of four to six people. Each student is also assigned a mentor from the previous year’s class to provide guidance. The program is completed over the course of five semesters, including a summer semester with six credit hours’ worth of classes. The class of 2018 currently has 79 students with an average GMAT score of 628. Their average GPA is 3.34 and they are composed of 25 percent international students and 32 percent female students. McCombs School of Business was recently ranked as 11th in the nation for business schools with the highest percent of job offers. About 50 percent of working professional students choose to access On-Campus Recruiting services. MBA students at McCombs have access to the Career Management Team. With the help of the Career Management Team, students can connect with McCombs’ alumni network, receive personalized career guidance and attend networking receptions and career fairs. 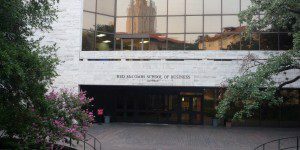 The UT Austin Weekend MBA program costs $22,100 for the first semester and $22,090 for the following four semesters, totaling $110,460 for the class of 2019. This includes tuition and registration fees, all course materials including an iPad, foreign travel insurance, lodging and meals during a global residency, a residency component during the first semester and on select weekends throughout the program, student meals during class weekends, career management advisors and recruiting events, workshops and meetings with career coaches and a guest speaker series. This cost is paid in equal installments over the whole program, usually due six weeks before the semester begins. A $2,000 deposit is required once applicants accept admission. Applicants to the Dallas Weekend MBA program at the McCombs School of Business must have a Bachelor’s degree or a comparable degree from a foreign academic institution. The application process is completely online. Applicants submit a completed application, official transcripts, GRE or GMAT scores, a current resume, one professional recommendation letter and a $200 application fee. Students must also submit one required essay and may submit two optional essays. The required essay asks the applicant to explain their motivation for choosing McCombs. The first optional essay is an introduction of the student. It can be completed in one of three formats: a 250-word essay, a one-minute video or a shared “about.me” page. The final optional essay is an opportunity to explain any area of concern with your application.